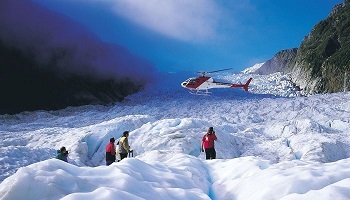 The fly-in, fly-out helihike combines the excitement of walking on the Fox Glacier with the thrill of helicopter flights. 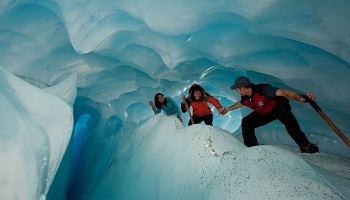 By flying in you are able to access and explore a part of the glacier where its forces work hardest and often create spectacular ice caves and arches. Equipped with leather boots and other equipment, you board the helicopter for your first flight over the pinnacles of the lower icefall. Here, the ice is in constant motion. Take in views of the dramatic upper icefall and Victoria Falls, which is the melt river of the hidden Victoria glacier, before landing. Your landing site on the ice is a remote and exceptionally beautiful part of the glacier. 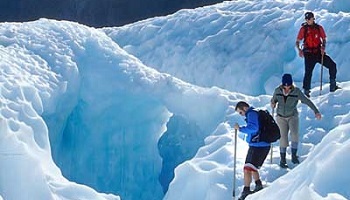 At this stage, your guide outfits you with crampons, specially designed for these ice conditions and you follow the ice steps cut by your guide as you explore the amazing formations and ice caves which are only seen here.